JOHANNESBURG, South Africa, February 17, 2011 (ENS) – More than 350 Johannesburg taxis were scrapped last week, when the owners handed over their operating licenses and officially bought their shares in PioTrans, the company contracted to run the city’s bus rapid transit system, Rea Vaya. The event took place in the scrapping yard in Nancefield, Soweto, surrounded by many dilapidated taxis. After the batteries were removed, the taxis were placed into a compactor which crushed them into a rectangular shape about a metre-and-a-half in size. The scrap metal will be recycled in the city’s largest scrapping exercise to date. 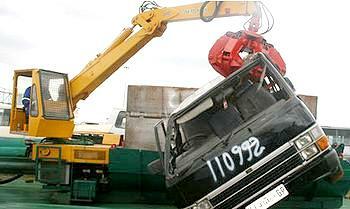 Taxi owners used the proceeds from scrapping the vehicles to buy PioTrans shares. “Today we celebrate a major milestone in the life of the taxi industry and of our country,” Minister of Transport Sibusiso Ndebele said at the handover. He congratulated the city for working with the industry to accomplish the transition. “Today we reaffirm that this important industry which is owned, managed and controlled by black entrepreneurs will no longer be defined primarily by violence and disorder,” Ndebele said. The Rea Vaya bus rapid transit system was previously a cause of conflict between city officials and the taxi industry, as drivers saw their livelihoods at risk. During negotiations between Rea Vaya and the taxi industry it was agreed that one employee per affected vehicle would be given a job. As a result, 200 former taxi employees got work as bus drivers and 150 were employed at Rea Vaya stations as ambassadors and marshals. Former taxi owners from the Greater Johannesburg Taxi Council and Top Six Management, now own 66.7 percent of the shares in the bus operating company PioTrans. The remainder is owned by the City of Johannesburg. PioTrans has appointed a board that includes 13 taxi operators who invested in it. Rea Vaya’s bus operating company was originally established as an interim measure, pending the raising of share capital and scrapping of the taxis. This interim company, Clidet, was handed over to the new company, PioTrans, at the beginning of February. Shareholders in PioTrans are the nine taxi operator investor companies and one trust that have been working with the city of Johannesburg to create Rea Vaya. There are now 316 operators who are shareholders. Rea Vaya is the city’s flagship public transport project. City officials say it rolls back the legacy of apartheid spatial planning and poor public transport infrastructure, and improves the quality of life. Johannesburg adopted bus rapid transit as a long-term mass transit solution in 2006, with the first buses up and running from August 2009, in plenty of time for the World Cup matches in June and July 2010. Rea Vaya buses run between Soweto and Johannesburg, passing both Soccer City and Ellis Park stadiums. 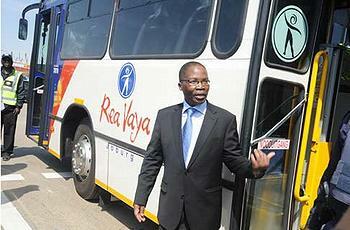 Currently, Rea Vaya transports an average of 30,000 passengers a day on 143 buses that travel to some 30 stations. Representatives of Fanalca, an experienced bus rapid transit operator from Colombia, are helping the taxi industry run the new bus rapid transit company.